Martha Jane McDowell has long been one of my favorite artists/ sculptors/ creative spirits because she is always willing to work in new mediums and her work generally has an element of wry humor. This concrete and tile goat, titled Sustainable Living I, is determinedly consuming recyclable plastic bottles. The title worked for me on several levels. 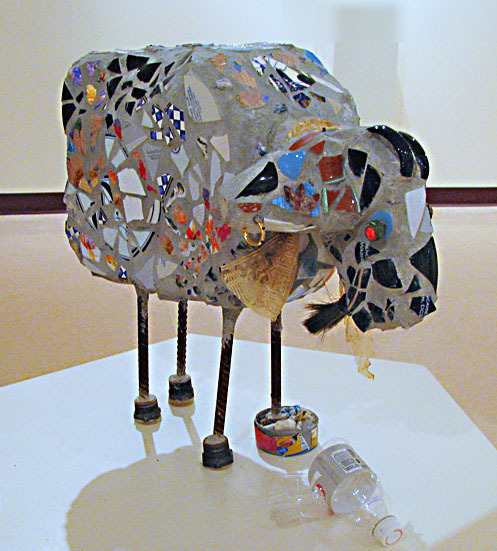 The goat is recycled and it is depicted in the act of recycling. With its skinny rebar legs, and its lacework scarf and gold earring, it has a certain jaunty air even while it reminded me of those unfortunates who eke out a living picking through other people’s refuse. Like many of Martha’s works, it made me think of issues far beyond the quiet gallery in which it stands. Way to go, Martha! I can’t wait to see what you do next. There are many excellent artists on display in the Jacksonville Center’s Hayloft Gallery. Indulge yourself and take an hour to wander through the 6th Annual New Works Exhibition by Regional Artists which runs through September 29. You may find that every piece on display has something to say to you. This entry was posted in Artists and their art, Jacksonville Center and tagged Floyd Virginia, Hayloft Gallery, Jacksonville Center for the Arts, Martha Jane McDowell, Sustainable Living I. Bookmark the permalink. I love Martha Jane’s work too. I have one of her pink flamingos with a black bow tie prints on my living room wall! Such whimsy!